Who of us didn’t visit ebay, amazon to buy anything or his personal bank account to check it. Do you think that those sites are secure enough to put your personal data like (credit card number or bank account number, etc.,)? Most of those sites use the Socket Layer (SSL) protocol to secure their Internet applications. SSL allows the data from a client, such as a Web browser, to be encrypted prior to transmission so that someone trying to sniff the data is unable to decipher it. Many Java application servers and Web servers support the use of keystores for SSL configuration. 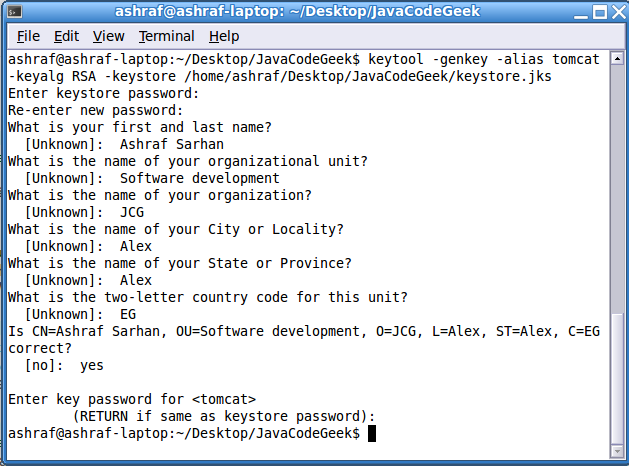 If you’re building secure Java programs, learning to build a keystore is the first step. The world of SSL has, essentially, three types of certificates: private keys, public keys (also called public certificates or site certificates), and root certificates. The private key contains the identity information of the server, along with a key value. It should keep this key safe and protected by password because it’s used to negotiate the hash during the handshake. It can be used by someone to decrypt the traffic and get your personal information. It like leaving your house key in the door lock. The public certificate (public key) is the portion that is presented to a client, it likes your personal passport when you show in the Airport. The public certificate, tightly associated to the private key, is created from the private key using a Certificate Signing Request (CSR). After you create a private key, you create a CSR, which is sent to your Certificate Authority (CA). The CA returns a signed certificate, which has information about the server identity and about the CA. Root CA Certificate is a CA Certificate which is simply a Self-signed Certificate. This certificate represents a entity which issues certificate and is known as Certificate Authority or the CA such as VeriSign, Thawte, etc. Companies who will sign certificates for you such as VeriSign, Thawte, Commodo, GetTrust. Also, many companies and institutions act as their own CA, either by building a complete implementation from scratch, or by using an open source option, such as OpenSSL. When a server and client establish an SSL connection, a certificate is presented to the client; the client should determine whether to trust this certificate, a process called the certificate chain. The client examines the issuer of a certificate, searches its list of trusted root certificates, and compares the issuer on the presented certificate to the subjects of the trusted certificates. If a match is found, the connection proceeds. If not, the Web browsers may pop up a dialog box, warning you that it cannot trust the certificate and offering the option to trust the certificate. Java Keytool is a key and certificate management utility. It allows users to manage their own public/private key pairs and certificates. 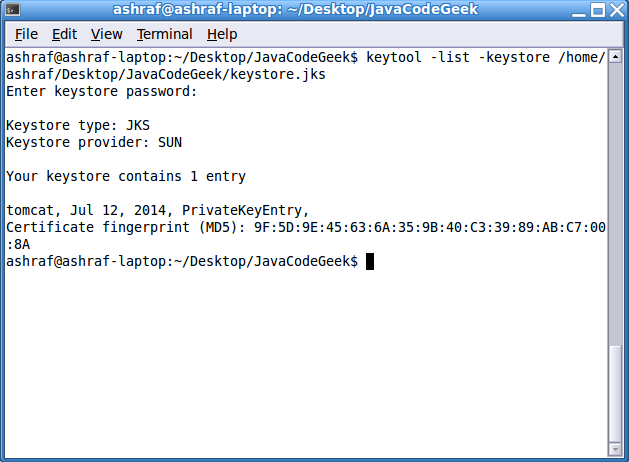 Java Keytool stores the keys and certificates in what is called a keystore. It protects private keys with a password. Each certificate in a Java keystore is associated with a unique alias. When creating a Java keystore you will first create the .jks file that will initially only contain the private key, then generate a CSR. Then you will import the certificate to the keystore including any root certificates. Generate new keystore and self-signed certificateusing this command, you will prompt to enter specific information such as user name, organization unit, company and location. <Connector port="8443" maxThreads="150" scheme="https" secure="true"
Start Tomcat and go tohttps://localhost:8443/, you will find the following security issue where the browser will present untrusted error messages. In the case of e-commerce, such error messages result in immediate lack of confidence in the website and organizations risk losing confidence and business from the majority of consumers, that's normal as your certificate isn't signed yet by CA such as Thawte or Verisign who will verify the identity of the requester and issue a signed certificate. 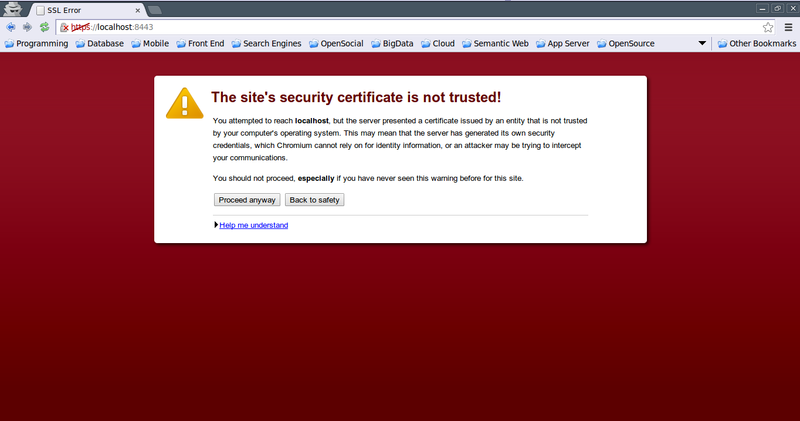 You can click Proceed anyway till you receive you signed certificate. 29 Comments Views Tweet it! Very interesting article – would it be possible to share an image which explains / shows a mutual authentication? In other words, steps when a server has to validate clients as well. 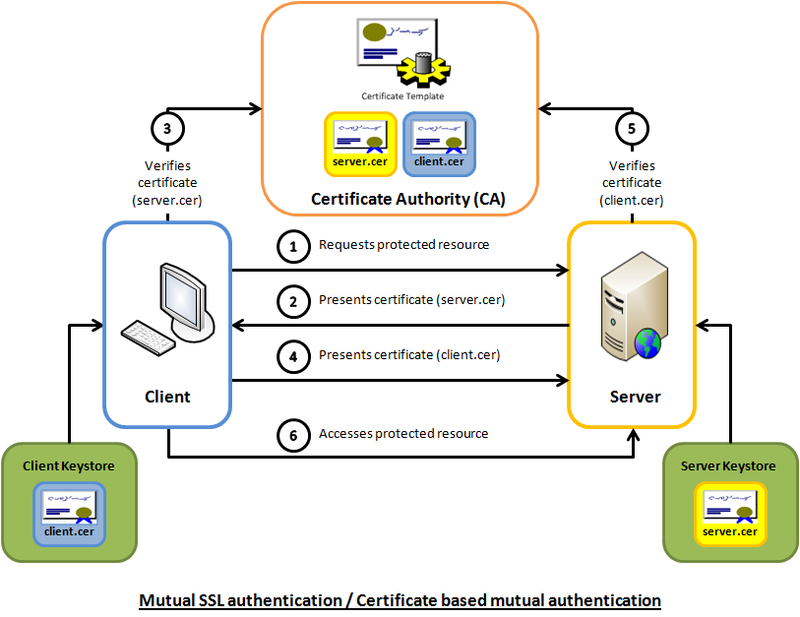 Just, take a look on this image which explains the mutual authentication. It’s very nice article. I worked with you in pivotal office couple of months ago. I was looking for a smart solution for below. Help will be really appreciated. I need to make a “webservicetemplate” ssl soap service invocation where I have jks file and password with me. Looking for best solution with annotations and spring properties. Nice article! I would like to indicate the tool kse (keyStore explorer) at sourceforge. Not affiliate in any way but it sure makes it easier to understand the concepts since the GUI hides the command line, intimidating at first for some. Nothing wrong with command line , I use myself everyday and should be the preferred way in a production server, but a GUI helps while one is not familiar with the concepts. Kudos for your addition, It’s a good idea to use the GUI tool specially for beginners. Regarding the spy sign at the top left of the browser window, That’s because I had opened the Chromium in incognito mode. It’s a good point, it adds more security stack. Just, take a look on this image which explains the mutual authentication. If the URL is also encrypted, how will domain name resolution happen as the DNS server can not decrypt the URL since only the private key can do the same and that is available only with the origin server. Thanks for raising this point. Although the https guarantees the encrypted secure connection where the whole URL with its data are encrypted, DNS lookup request which resolves the domain name like “javacodegeeks.com” to numbers like “64.64.30.146” is sent through a separate unencrypted traffic before encrypting the URL, leaving you open to spoofing and man-in-the-middle attacks. DNSCrypt can lock that down. Thanks for your response. On DNSCrypt, does it come integrated with browsers or is it an add-on? How can it be plugged in when a user wants to access a secure site? I also wanted to know which ciphers and hashing are used in the SSL communication. It was build on the Public-key cryptography (asymmetric) which uses encryption algorithms like RSA and Elliptic Curve Cryptography (ECC) to create the public and private keys. With asymmetric encryption it is computationally easy to generate public and private keys, encrypt messages with the public key, and decrypt messages with the private key. However, it is extremely difficult (or impossible) for anyone to derive the private key based only on the public key. for relative urls on an html page [ones of the type “../images/someImage.jpg”], will the browser fetch them on a secure channel? was curious to know how it is accomplished. Any time an HTML image link is created within a page using the entire, “absolute” URL for the image file’s location, the resulting image link will not be encrypted by any SSL on the site. Sorry, I think the comment doesn’t accept HTML elements! BTW, I mean that you should have the images hosted on your store, then you can use the relative link “/assets/photo1.jpg” instead of “absolute” URL like “http://www.yourvolusionstore.com/assets/photo1.jpg”. Also. if you have an image which hosted on a web server outside your store (e.g. a Flickr account), you’ll need to modify the “absolute” image link to use the secure “https” protocol and the hosting server in question must support the “https” protocol. I am encryption and decryption small data is fine, but I try to encrypt long data(my data having a 5725 characters), I am getting “java.lang.ArrayIndexOutOfBoundsException: too much data for RSA block” exception in java. please help me how to solve this problem. I am trying to create sso login using cas for some of the applications in Tomcat. Can you please tell me about the configurations to be made for the applications in Tomcat to get SSO Login through cas. i’ve tried to generate a new jks file but the password that i use recently can’t be identify. How do i check the password that i used before? You can check your certificate using “keytool -list -v -keystore keystore.jks” and you will be asked for the password but if you forgot it, you can generate your jks again. Thanks Ashraf for the nice explanation. On mozzile :- cannot communicate securely with peer: no common encryption algorithm(s). Error code: SSL_ERROR_NO_CYPHER_OVERLAP . let me know what is reason behind getting the error on ec2-instance and not locally and how to fix it. This was very very helpful for me, Highly appreciate the good work..